Bulk Storage shelving resembles pallet rack except that it has a lower weight capasity. Another name for Bulk Storage is Light Weight Pallet Rack. This shelving is not intended for forklift use. Bulk Storage is ideal for all hand stored items ranging from boxes to loose product for storage. 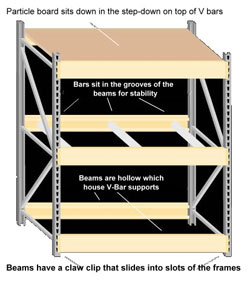 Weight capacities vary as do sizes of Frames & Beams. Bulk Storage shelving can use either particle board or wire decks as it's shelves.